SAN FRANCISCO -- The dependable bullpen that has been such a key part of San Francisco's even-year championship success this decade is showing its flaws. And manager Bruce Bochy plans to address it soon in a meeting with his coaches to make sure things are all lined up for a strong second half and what the Giants hope is another special playoff run. All-Star Nolan Arenado hit a go-ahead three-run home run in the seventh inning to give Colorado the big hit it has missed for much of the past week, and the Rockies beat San Francisco 7-3 on Tuesday night to end a season-high six-game losing streak. "We're going to meet and see if we can get this thing right," Bochy said. "We're trying to get this thing sorted out. At times they're really good. It's a matter of somebody stepping up and taking over a role." Colorado catcher Nick Hundley and San Francisco's Angel Pagan exchanged words in the seventh during Pagan's at-bat, and Hundley said something as Pagan turned to return to the dugout after a swinging strikeout. Pagan then gestured back toward the catcher before plate umpire Carlos Torres and Hundley had a heated chat. Rockies manager Walt Weiss rushed out, then the umpires gathered in the infield and both benches were warned but no ejections made. "It was just some good clean fun," Weiss said. Hundley was booed loudly when he batted in the eighth, then he delivered an RBI single. "It's such a cyclical game," Hundley said. "I've been bad at the plate the last week. It was big to get a couple hits in big innings." Colorado capitalized against San Francisco's shaky bullpen once ace Madison Bumgarner left, scoring more than one run for the first time in its last five games. 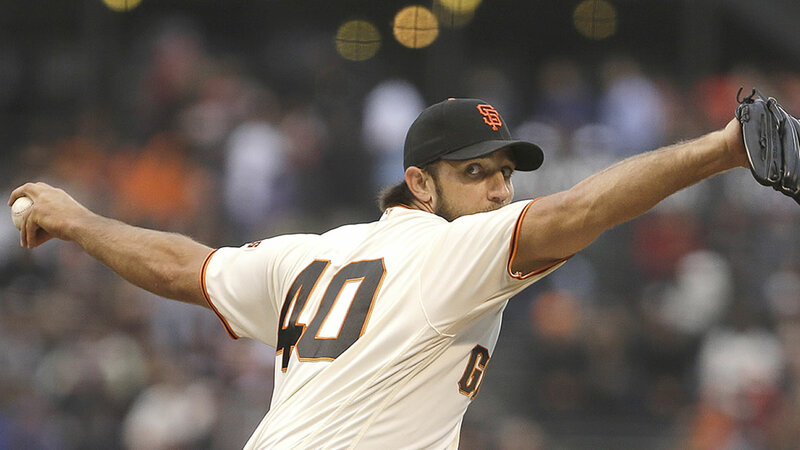 Bumgarner, named to his fourth straight All-Star Game a few hours earlier, struck out six over six scoreless innings, allowed four hits and walked two. Jordan Lyles (2-2) pitched the sixth for the win. After George Kontos allowed a pair of singles to start the seventh, DJ LeMahieu hit an RBI infield single in the seventh against loser Cory Gearrin (3-1). Arenado followed with his 23rd home run. Colorado had failed of late to give its pitchers enough run support. Arenado's big swing did it this time, then the Rockies added on late. Since the start of last season, Arenado has 14 homers and 45 RBIs in 31 games against the Giants. LeMahieu drew a bases-loaded walk from Hunter Strickland in the eighth and Charlie Blackmon added a run-scoring single. "Consistency's been missing a little bit from what we've seen," lefty reliever Javier Lopez said. "Obviously when we click, we've shown that we click really well. We're running through a little rough patch right now, and it's the big homer that's been getting us as of late, but you've got to try to focus on the good things. We're having a good first half. You don't want these little things to manifest. We'll nip it in the bud." Bumgarner - 4-0 with a 1.93 ERA in his last six starts against Colorado - threw 96 pitches, ending his majors-leading streak of 13 straight outings with at least 100 pitches. Brandon Belt hit an RBI single in the first, trying to make a case to be the last NL All-Star chosen in a final vote by fans, then added another base hit in the third. The Giants scored their second run on a passed ball in the fifth, with Pagan coming home after a leadoff triple. With the bases loaded in the third, Giants right fielder Mac Williamson robbed Rockies rookie Trevor Story - another All-Star final ballot candidate - of a likely bases-clearing hit for the clutch final out of the inning. Rockies right-hander Tyler Chatwood came off the disabled list from a strained middle back that sidelined him June 19. He allowed three hits, two runs, one earned, struck out four and walked four in five innings.